ToyoMotors Phoenix, AZ car repair family has been providing top rated auto service in the Phoenix area since 1980. Keeping your car safe and reliable for many years has always been a passion of our car repair Phoenix family. ToyoMotors was founded by Neil and Theresa Geesey, our repair and service center follows many years of Geesey family tradition. Our recipe for Phoenix, AZ car repair success is simple: We offer the highest level of training and expertise for your modern vehicle’s car repair and service. We will always treat you, our highly valued customer, as an extension of our family! This truly sets us apart from most in the Phoenix, AZ car repair industry. As far as expertise and technology, we are no small business! 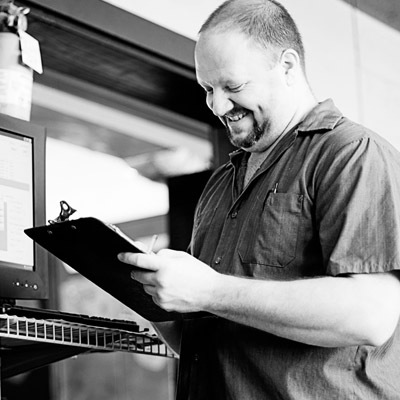 With today’s advancements in car repair and service you must keep up with technical training, product knowledge, and advanced equipment. At ToyoMotors Car Repair Phoenix, AZ, we don’t just keep up, we are amongst the leaders in the industry. Our car repair Technicians have a minimum of 22 years experience, and are all Master Certified through ASE – the Phoenix, AZ car repair certification authorities. Our equipment list is extensive, and high tech with an investment thus far totaling over $475,000! With this arsenal we can certainly handle most, if not all of your car service needs! We have computers and digital cameras in every bay, and have also invented and patented a software that allows you, the client, to see beyond the fenders, panels or wheels of the automobile to actually observe the internal workings of the car repair! Our goal with this software is that you have a clear understanding of the car service that you are paying for, and that you feel comfortable through superior visual communication. At ToyoMotors Car Repair Phoenix, AZ you get high-tech specialized auto repair and service combined with old-fashioned service and family values. We Will Save You Money – Guaranteed! Everyone is looking for ways to save a buck these days, and that includes us. When it comes to auto repair however there are some things that you should be aware of. The lowest priced ad or quote over the phone is not always the lowest cost, and many times these become much higher once the vehicle is taken to the shop. And you cannot, I repeat CANNOT, compromise when it comes to quality of technician, and quality of parts. When you choose ToyoMotors Auto Care for your auto repair and service needs we will save you lots of money, without compromise! Especially over dealer and chain store service centers. Do you know what the two most expensive service and repairs for your automobile are? 1.Shotgun Blast – you may be surprised at how many times this happens in this business, even at the dealer level! Many do not have the desire, the knowledge, or the equipment to pinpoint a specific problem. In an effort to fix a problem, or get more money, they sell three or four items to you when only one may be necessary. We call this the shotgun blast because it replaces all the items in the area. While it may fix the problem it is not professional and accurate, and it will certainly cost YOU more money! Completely Incorrect – This one speaks for itself, if your shop is guessing instead of diagnosing, you could be getting things replaced or serviced that may not need to be done, therefore adding undue expense to YOUR vehicle costs. 2.Unneeded Repair or Service – This is something that we see all the time. The biggest offenders are the chain stores who lure people in with seemingly low cost deals, and then upsell several items on the backend, most not even needing to be done. Unfortunately even the dealers have started to play this game, pressure sales, and sales quotas cause some to sell without conscience. Also items that have several months or even a year of life remaining are prioritized as needing to be done today. We have even seen items that have no signs of deterioration or that are completely unnecessary being recommended. This is also a waste of YOUR hard earned dollar. At ToyoMotors Auto Care you will experience an unbelievable difference! Our specialists will diagnose repair needs with pinpoint accuracy. We will never recommend a maintenance or service item that your vehicle does not need. If your vehicle does have needs, we will prioritize them so you will be able make the best decisions possible. We will recommend proper vehicle maintenance to prolong the life of your car or truck, this will assist you in avoiding costly breakdown. The parts we choose are original equipment or better, which gives extended life. We recently had a young professional woman named Kellie, who contacted us after finding us through a google search online. She initially called for a price on resealing the power steering pump on her 2005 Honda Accord, explaining that her local dealer had diagnosed and quoted her $350 for the repair. Our service manager, Naomi asked her if she had experienced any steering noise or fluid leakage on the ground, to which she responded none. Naomi suggested a second opinion by our mechanics explaining that price shopping for a repair that we’re not even sure it needs is not only a waste of time, but probably the worst way to find a qualified, honest mechanic. We set an appointment to examine the vehicle, and did so the next day. The results: we found the power steering pump was perfect, no defect whatsoever. Needless to say Kellie was very happy, and although we did not make a single dollar on this visit, we have a customer for life for conducting business the right way. This is the way we conduct business everyday at ToyoMotors Auto Care, and we would love to welcome you as a new customer. Please see our Car Repair Phoenix, AZ Special Offer for New Customers.